Krispy Kreme unveils three new spring-themed donuts for 2019 that can be found at participating locations nationwide for a limited time. - Bunny Donut - A Chocolate Kreme-filled donut dipped in icing and decorated like a bunny with chocolate and pink icing, and sugar ears. - Chick Donut - A cake batter-filled donut dipped in yellow icing and decorated like a chick. 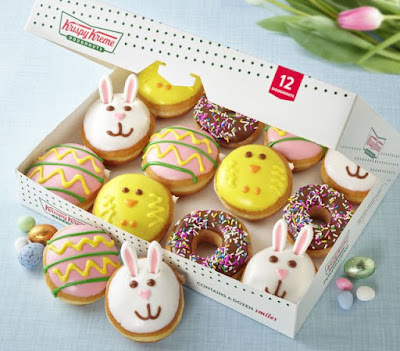 - Decorated Egg Donut - A classic vanilla Kreme-filled donut dipped in strawberry-flavored icing and decorated with an egg design.